You know you should back up your data. And many of you also know that Apple’s made it easy to do with the Time Machine technology that's built into Leopard and Snow Leopard. Yet the majority of people do not regularly back up their data. While some may fail to do so because they believe it’s a complicated process, and others because of their misplaced faith in the robustness of hard drives, many Mac users simply don’t have a reasonable idea of what to back up and how to best go about it. That’s where we can help. Perhaps the best way to determine which data to back up is to consider just how terrible you’d feel after losing a particular class of data. The Personal and Irreplaceable. When considering what to back up, this is the first broad filter you should employ—data and media that holds a special place in your heart and can’t be recreated. High on the list of the Personal and Irreplaceable are photos and home videos. Although it’s possible that you have the original images and videos on a tape or storage card, unless you’re the worst sort of hoarder, it’s likely you’ve erased or overwritten the original content. This is important to back up. Your teenager will never again be a toddler nor will your hairline naturally return to its 2002 whereabouts. And unless you have a photographic memory, you can’t recreate the letters you sent to your lady love in college (but really, you should have hand-written them). If such documented memories are important to you, backing up such media is the first thing you should do. Reaction if lost: Weeping and garment rending. If Lost Will Get You Fired Or Thrown in Jail. Nearly as important as The Personal and Irreplaceable is that data which, if missing, threatens your job or freedom. Such files include work documents you’ve brought home that aren’t backed up at your place of business, documents you’ve spent months creating for tomorrow’s presentation, the Great American Screenplay due to the director in two day’s time, and your tax records. Reaction if lost: Trembling fear. Reaction if lost: Non-stop cursing. The Rest. This can be old e-mail, applications that you haven’t run since transitioning from OS 9 to OS X, your résumé from 1997… just about anything that you thought you might need some day but, in truth, were unlikely to ever look at again. The days of casually jamming a floppy disk into a slot and dragging a couple of files on to that disk are gone. We now have multiple gigabytes of data to back up and slow, low-capacity solutions are no longer an option. These are the common backup choices at your disposal. Writable optical media. Although Apple sees writable CD and DVD media as something of a dead-end, a lot of today’s Macs still bear a SuperDrive. Proponents of these discs once promised this media would survive for dozens of years. Regrettably, such claims haven’t been born out by the facts. Writeable CDs and DVDs can degrade over time, particularly when exposed to sunlight and moisture. And scratch it badly enough and your data is toast. It’s also a terribly slow means for backing up a lot of data. In a pinch, however, it’s a reasonable part of a sneakernet solution—one where you need to easily move data from one computer to another when you don’t have a network connecting the two. While not natively supported by the Mac, writable Blu-ray discs are another option. Although subject to the same environmental threats as CD and DVD media, they hold more data—25GB on a single-layer disc and 50GB with dual-layer media. And Blu-ray burners have dropped in price. For around $250 you can purchase an external Blu-ray burner and copy of Roxio’s Toast Titanium 10 Pro ( ), which allows your Mac to burn Blu-ray discs. A Mac with second hard drive. Attaching a second hard drive to your Mac is the most common way to use Time Machine. Just plug in a FireWire or USB drive (or add a second internal drive if your Mac allows), switch on Time Machine, and let it do its stuff. Although Time Machine doesn’t allow you to choose specific items to back up, it does let you exclude items. So, for example, you could save some space by asking it to exclude the System folder at the root level of your startup drive. When you do this Time Machine offers you the option to additionally exclude all system applications and UNIX tools. This may be the easiest way to back up your data as it requires effort no greater than purchasing and plugging in a compatible hard drive. Excluding system files from your backup can save you a lot of space. The pros are obvious. Configuring a Time Machine backup with a second hard drive is dead simple to set up. The greatest effort it takes is purchasing the drive and plugging it in. The cons may not be quite so apparent to everyone. Should there be a cataclysmic event—a massive power surge, fire, flood, or earthquake—you could lose both your Mac’s hard drive and the secondary drive attached to it. Mac with two external hard drives. The idea is similar as the single back up drive. The difference is that you rotate the drives and keep one of the drives off-site—in a bank’s safe deposit box, for example, or at a friend’s house. (If you have to store it on-site, get a waterproof fire-safe and place your second drive in it.) So, attach Drive A on Monday and let it back up your Mac throughout the week. Detach it on Sunday and swap in Drive B, allowing it to back up the Mac during the next week. If the worst happens, you lose, at most, a single week’s work. Time Capsule with network of Macs. If you have multiple Macs to back up, Apple has a solution in the form of its 1TB and 2TB Time Capsule wireless hard drive/routers (priced at $299 and $499 respectively). Like the single hard drive solution, it means your backup drive is on-site. Home network server. If you live in a home with multiple Macs consider turning one of those Macs into a backup server. Detailed at length in the linked article, you can use a variety of software tools to automate the backup of multiple Macs over a network to a hard drive attached to the server. RAID backup. RAID arrays—boxes that contain multiple hard drives packed with redundant data—were once the purview of corporations and well-heeled geeks. Thanks to Data Robotics’ Drobo and similar simplified RAID arrays, such boxes are now finding their way into home offices. “Redundant” is the key advantage here. If one of the array’s hard drives takes a dive, your data is still safe, as it’s backed up on another of the device’s drives. Again, it’s an on-site solution so it’s threatened by the same acts of nature that can destroy your Mac. Online backup. Online backup provides a way to protect your data from those on-site disasters. Using an online backup solution such as MobileMe’s iDisk, Dropbox, or one of the many commercial online backup services you can upload your most precious data to the cloud. Should a real cloud flood your Mac and its local backup solutions, you can restore your data from the ether. How you backup depends a great deal on what you backup. You will, for example, wish to make multiple backups of Personal and Irreplaceable data and keep a rotating off-site backup. The rest can be backed up to the Time Machine drive attached to your Mac or, if you’re tired of being tethered to the past, ignored altogether. Now that you’ve determined which data is the most precious to you and understand the options for backing it up, let’s consider the steps you should take to back it up. For your most prized data you must have a redundant backup plan. This starts with at least one local backup drive running Time Machine or another hunk of backup software—a tool such as Shirt Pocket Software’s $28 SuperDuper ( ) or Bombich Software’s free Carbon Copy Cloner ( ) if you want a bootable backup. (Optionally you can back up to a home network server.) A second backup drive that you keep off-site and rotate in on a regular basis is the second step. For the crème de la crème of your data collection—your iPhoto library and iMovie projects, for example—add an online storage service. This provides off-site backup without you having to leave the house. If you can get by with just a couple of gigabytes of storage, Dropbox is an excellent and free choice. If you need up to 20GB of storage and have a MobileMe account, use your iDisk. And if you have a lot of data (and plenty of time to wait for it to upload) consider a more flexible online storage solution such as the $54-a-year CrashPlan. CrashPlan not only lets you back up your data to its servers, but you can also back up data to a friend’s computer. Such a redundant backup plan should leave you fairly well protected. But there are additional steps you can take. iTunes provides an additional level of backup protection. 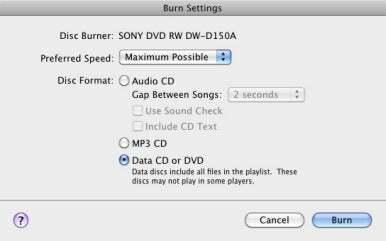 You can burn a selected playlist to CD or DVD as data. To properly configure this option, select a playlist in iTunes’ Source list and choose File -> Burn Playlist to Disc. In the Burn Settings window that appears, enable the Data CD or DVD option and click the Burn button. After inserting a blank disc you’ll be told that the disc is only for data storage. If there’s more data than will fit on a single disc you’ll be asked if you’d like to split the playlist across multiple discs. Click Data Discs to confirm your choice to do so. Burn your music to disc as data. Regrettably, iPhoto no longer offers an option to back up your iPhoto library to optical media. Rather, you can burn only images to the disc rather than the library itself and you can’t burn to multiple discs if the selected number of photos won’t fit on a single CD or DVD. While you don’t need to back up your applications—because you can always install fresh copies—you should absolutely keep a record of your applications’ serial numbers and registration codes. That way, should you lose those applications, you needn’t go through the bother of contacting each software company in the hope that they’ll supply you with the numbers you need to run their programs. Similarly, having a copy of your passwords and Internet configuration information will be a godsend if your hard drive dies. You can back up many Internet passwords by making a copy of your keychains. You’ll find them by going to youruserfolder/Library/Keychains. Agile Web Solutions’ $40 1Password ( ) is a terrific way to create and store passwords. Additionally, you can export 1Password archives for backup. These files should be part of a larger backup, but it doesn’t hurt to keep spare copies around. As for Internet configuration settings, one of the easiest ways to "back them up" is to take screen shots of the appropriate Network system preference and AirPort Utility screens and then print and back up those screen shots. For many of us it’s no exaggeration to say that we store much of our lives on our Macs—be it our financial history, online personalities, media, or memories. Losing that data is no longer a minor inconvenience. And because it isn’t, we must take serious steps to back it up. You now know what to back up and how to go about it. All that’s left is the seemingly most difficult step—actually taking the time to do it.